For Zack Thomson, life in the Nicholls Ward wasn't so bad. After his parents died, he developed strange allergies, and the mental institution was the only place where he could be properly looked after. As strange as it was, it was home. But that all changes the night a stranger on a Harley crashes through the front doors and tells him to run. Along with his best friend Charlie and a girl he may or may not be falling in love with, Zack does just that: run. Under the cover of night, hiding amongst the shadows, he races for the truth. The Nicholls Ward is all that Zack knows. He isn't crazy, but with all his allergies, he never really leaves the mental ward. It's nice enough there, and his nurse, Ophelia, is almost like a mother to him. When a strange man crashes into the ward on a motorcycle and tells Zack that someone is after him, Zack's life is forever changed. Now he's on the run, with only his best friend to turn to and enemies popping out of the woodwork. Can Zack make it out of this alive? Night Runner is a great vampire read for middle grade kids or older reluctant readers, as it's an easy, fast-paced read. While it is a little implausible that Zack didn't even know he was a vampire, it's still a cute book. I loved the angle the author takes with the vampires - they all eventually face Endpoint Psychosis, and some vampires are in charge of keeping other vampires in line or taking them out of commission if they've contracted EP. Night Runner is a great book. One little thing I have to mention is that the Canadian spelling is kept, something that seems to be unusual these days for Canadian (or British, Aussie, etc.) authors published in the U.S. Authors like Kelley Armstrong Also seemingly gone are the days of glossaries of terms, like they did for John Marsden's Tomorrow series. Kids need to learn how to figure these things out in context! Kudos to the publisher for leaving the spelling and grammar alone. 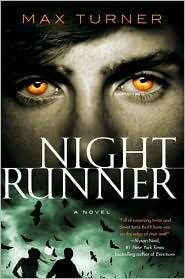 Stop by tomorrow for a review of the second book in the Night Runner series, End of Days!